Gavin arrived at the Medina Raptor Center in March 2014. What happened to her is unknown, however she was found very thin with a right wing droop and injury to his right eye, impairing his vision. She was added to the permit where he will serve as both an educational ambassador and a foster to any juvenile red-shouldered hawks that come in for rehabilitation. Originally she was thought to be male, based on her weight, and now that she has reached a healthy weight, we now know that Gavin is a female. 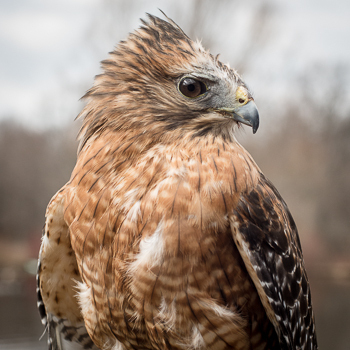 It is one of the most recognizable hawks in North America, with the ruddy-reddish chest and distinctively banded tail. Small mammals, lizards, snakes and amphibians. Will occasionally hunt birds such as sparrows, starlings and doves. Birds in northeast North America from New York to Maine and across the northern border of the Midwest United States. Prefer hardwood forests, lowland deciduous swamps and upland mixed forests. They have adapted to urbanization and will hunt in suburban areas near woodlands. Hunt their prey by perching near a wooded body of water and wait for their prey to run beneath them. Stick nests about two feet in diameter lined with bark, moss and lichen. Will continue to add fresh leaves throughout nesting season and may use the same nest from the prior year. Altricial, covered in down, with a thicker layer of down growing in after hatching. Populations are increasing throughout most of their range. However, continued clearing of woodlands will have an impact on their nesting and hunting ranges. Rising kee-rah while soaring overhead.